The black 8x32 Rainforest Pro Waterproof Binocular from Meade is a compact and versatile binocular that fits perfectly in a pack, bag, or can hang comfortably around the neck for quick glassing on the go in all weather conditions. Phase corrected BAK 4 prisms and anti-reflection fully multicoated optics produce images that are bright and clear with true high-contrast colour. A 65° wide-angle apparent field of view provide expansive views while hunting, birding, or watching sporting events. Its nitrogen-filled optical tubes ensure that they won't fog with temperature fluctuation. The Rainforest Pro features an o-ring sealed waterproof aluminium alloy housing that is covered with a textured rubberized armour to protect it from drops and impacts while providing a non-slip grip. The black 10x32 Rainforest Pro Waterproof Binocular from Meade is a compact and versatile binocular that fits perfectly in a pack, bag, or can hang comfortably around the neck for quick glassing on the go in all weather conditions. Phase corrected BAK 4 prisms and anti-reflection fully multicoated optics produce images that are bright and clear with true high-contrast colour. A 65° wide-angle apparent field of view provide expansive views while hunting, birding, or watching sporting events. Its nitrogen-filled optical tubes ensure that they won't fog with temperature fluctuation. The Rainforest Pro features an o-ring sealed waterproof aluminium alloy housing that is covered with a textured rubberized armour to protect it from drops and impacts while providing a non-slip grip. 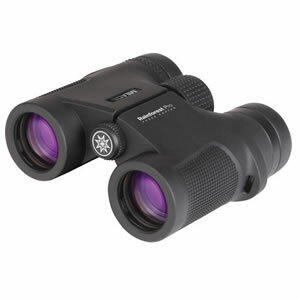 The black 8x42 Rainforest Pro Waterproof Binocular from Meade combine optical technologies with light-gathering ability to create an observing tool that will perform well from dawn to dusk and in all weather conditions. Phase corrected BAK 4 prisms and anti-reflection fully multicoated optics maximize the light that enters the 42mm objectives to produce images that are bright and clear with true high-contrast colour. A 63° apparent field of view provides expansive views on the trail, on the hunt, or at the stadium. Its nitrogen-filled optical tubes ensure that they won't fog with temperature fluctuation. The Rainforest Pro features an o-ring sealed waterproof aluminium alloy housing that is covered with a textured rubberized armour to protect it from drops and impacts while providing a non-slip grip. 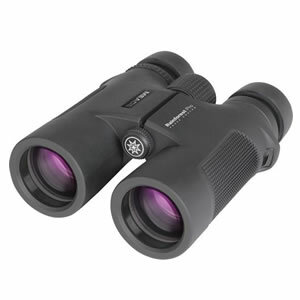 The black 10x42 Rainforest Pro Waterproof Binocular from Meade combine optical technologies with light-gathering ability to create an observing tool that will perform well from dawn to dusk and in all weather conditions. Phase corrected BAK 4 prisms and anti-reflection fully multicoated optics maximize the light that enters the 42mm objectives to produce images that are bright and clear with true high-contrast colour. A 51.7° apparent field of view provides expansive views on the trail, on the hunt, or at the stadium. Its nitrogen-filled optical tubes ensure that they won't fog with temperature fluctuation. The Rainforest Pro features an o-ring sealed waterproof aluminium alloy housing that is covered with a textured rubberized armour to protect it from drops and impacts while providing a non-slip grip.